What if Google decides to engage in higher education? I believe that they the power and the capabilities of doing it. Besides, Google is already performing high-level research and supports education activities such as Google Tech Talks. After all, Larry and Sergei might want to eventually get their Ph.D. degree and one way could be to bring an entire faculty at their own campus! Well, the point is: apart from aesthetics, from the user point of view, which one is more useful? 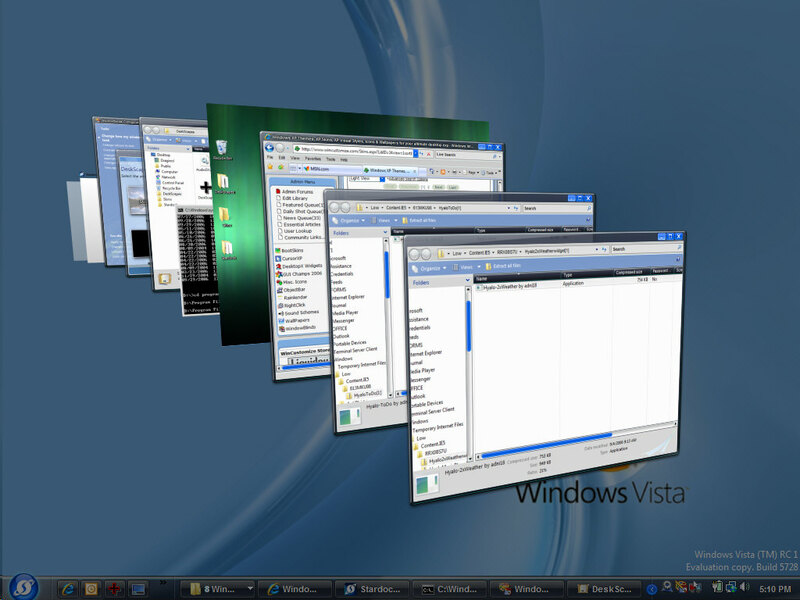 Vista's Flip3D is a substitute of the the ALT-Tab applications switcher. You can now visualize ALL the application windows in the middle of the screen as being "documents" from which select the relevant one. CowerFlow is a new visualization techniques that Apple has bought from SteelSkies. Unlike Flip3D, this technology is not bound to the desktop and can be used in different applications (API). In fact, it is already available in applications such as iTunes, AppleTV, and FrontRow. Enhancing the Finder by CoverFlow allows Mac OS-X user to visually access any type of document by its preview. CoverFlow has been proved to be useful in iTunes because it simply provides user with a better experience. I did not try Vista's Flip3D, but intuitively I can imagine how much this tool might enhance my user experience with the OS. Switching application should very fast and when I move from an application to another, I don't really care about the preview. I want to switch to the application, that's all. In contrast, is when I browsing the content of my hard-drive that I need to preview the content of the documents. So what? I believe that, as usual, Microsoft policy is about being impressive but not effective. Vista designers don't care about users, they just wanted to show how good they are at programming 3D interfaces. Maybe, Mac OS-X user interface is less impressive than Vista's one, but certainly more fluid and usable. Special effect are used with parsimony and when they can be of real help in providing a better user experience. Once again, I am proud of Being a Mac and not a PC! How to predict the future with Google! Today I will show you how to predict the future with Google! Then you copy the words describing the domain of expertise and past them in Google. In our case, you will have to submit this query. In order to be more effective, you can apply a simple heuristic: being a Swiss university, restrict to the ".ch" internet domain. Now you can proceed by yourself. You end up (among others) on a Ph.D. thesis written by somebody who happens to hold a temporary position in the same department that is offering the position. (Look carefully at the url: it contains the family name of the author). Now we have to wait until the position will be assigned to check whether Google really helps in predicting the future. While trying to cope to the mess in my computer, I discovered a link to a workshop on Ubiquitous Media and Social Infrastructure I attended during my visit in Stanford (August-October 2005). The workshop was organized by the Keio university, which is roughly the Japan equivalent of Stanford. The website contains the video recordings of all the speech. It is a nice memory... I hope you will enjoy the talks. One I suggest is that of Clifford Nass, maybe better known for inventing the Microsoft's (annoying) paperclip "Clippy"! !